The 11:11, a new performance venue in the heart of West Hollywood, will officially open its doors on Saturday, June 2, at 8pm. 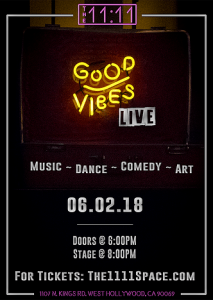 The theatre’s debut entertainment event, Good Vibes Live, will feature music, comedy, magic, dance, and art. Set to participate in this celebratory evening are (in alphabetical order) LA-based rhythmic experimental funk band Black Cat Majestik, electro-rock new wave band Chow Chow Mandy, LA’s own America’s Got Talent finalists Diavolo Dance Company, LA-based singer/songwriter Stephen James, comedian Diana Kawasaki, spoken word artist Marquesha Babers, writer/funnyman Rick Najera, award-winning magician Robert Ramirez, San Diego-based singer/songwriter Alexa Villa, actor/singer Devon Werkheiser, and LA-based improv troupe Jacob Womack/The Dragons. All appearances are subject to availability. Founded in the early 70s and originally called the Globe Playhouse, the space was renamed the Macha Theatre in 2000. Now, under the ownership of theatre and film production company An 11:11 Experience, the venue is expanding beyond traditional theatre to include live music, comedy, pop-up art-exhibits, film screenings, and private events. Good Vibes Live tickets are on sale at www.the1111space.com. The 11:11 is located at 1107 N. Kings Road in West Hollywood, 90069. 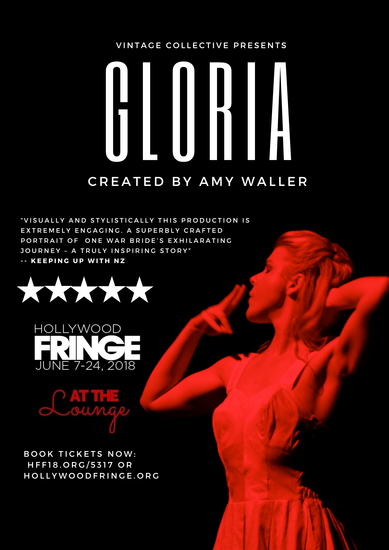 Vintage Collective announced today that following an acclaimed run in New Zealand, writer/performer Amy Waller will bring her acclaimed solo show Gloria to the Hollywood Fringe Festival for five performances only at the Lounge Theatre beginning June 3 at 8pm. Performance dates and times are as follows — Sunday 6/3 at 8pm; Saturday 6/9 at 10pm; Saturday 6/16 at 8pm; Sunday 6/17 at 4pm; and Thursday 6/21 at 10pm. Gloria follows the heartache, secrets, and bravery of New Zealand war bride Gloria Schmidt, whose marriage to an American serviceman made waves when she stood against the tide regardless of social disapproval. A fascinating and fearless solo show that leaps into flickering war-time romances, swing time dance halls, and sons lost to foreign fields. Based on a true story. Running time is 60 minutes. Amy Waller was born and raised in New Zealand by her Cincinnati-born parents. She received her acting training at Toi Whakaari: New Zealand Drama School and then worked as a series regular on the NZ dramedy Amazing Extraordinary Friends along with a variety of other leading roles in NZ and Australian television, film, and theatre. She successfully toured two shows around NZ which she wrote and performed in. Her three-woman comedy show Death by Cheerleader was nominated for and won several comedy awards. She is now based in LA where she continues to train in an all-female advanced comedy class, as well as improv, scene study, and dance. Her recent US acting credits include working alongside Jason Jones as the Christian sister pop group member Kylie Lee on TBS’s The Detour (created by Samantha Bee), and Lisbeth on ABC’s new Marvel series, Runaways. 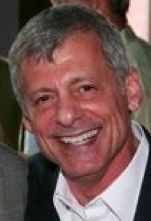 Tickets for Gloria are $15 and may be purchased online at www.hff18.org/5317 or by phone at (323) 455-4585. 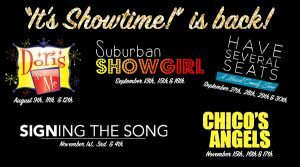 The Lounge Theatre is located at 6201 Santa Monica Boulevard in Hollywood, 90038.